8 Ways 3D Printlife will improve your 3d printing experience. We've all had failed prints due to poorly manufactured filament. Our filaments are all made in the USA with the highest quality materials and extrusion processes available. Our medical grade extrusion facility provides dimensional accuracy better than +/- 0.03mm, and delivers premium consistency of color and flow rate with each and every spool we ship. All of our filaments are eco-friendly, deliver outstanding performance, and we have many materials that do not produce toxic fumes or require a heated print bed. Click the graph at right to see how our bio-enhanced, eco-friendly Enviro ABS and PLAyPHAb high strength PLA compare to other popular brands. Who's using 3D Printlife? 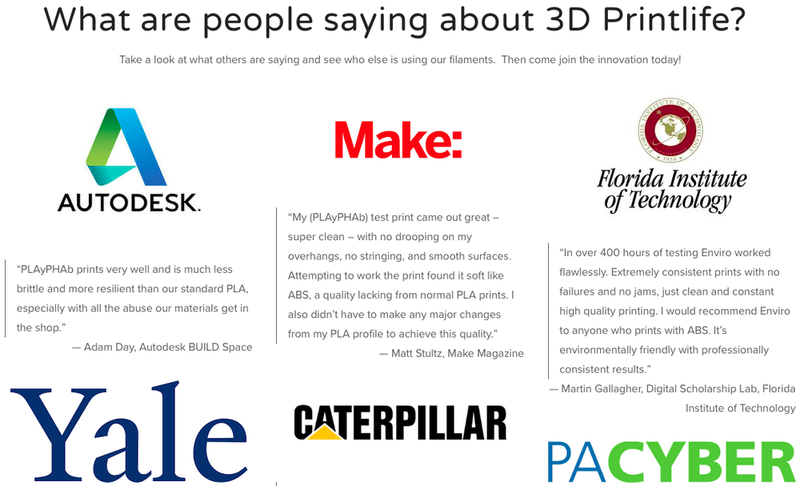 See what top research universities and Fortune 500 companies are saying about 3D Printlife's filaments. Tired of dealing with the unwanted waste of bulky plastic spools? Our unique eco-spool is made of biodegradable, heavy, recycled cardboard that is bound with a recyclable tin end cap creating a durable green alternative to the industry standard plastic spool. The flange even rotates so you can secure your filament strand wherever it's cut. 3D Printlife is committed to reducing the environmental impact of 3D Printing. To further that commitment 3D Printlife donates $1 from every spool sold to environmental charity to plant a tree. One spool equals one tree, rejuvenating iconic forests in key locations throughout the United States. We carry a wide selection of the best 3d printers in the industry to ensure you receive a reliable 3d printer that produces amazing prints. We are brand agnostic and we'll work to help you find the ideal 3d printer for you. Ask how you can save by bundling your printer with spools of our premium filaments! Want help from a human being? With over 30 years of experience in the consumables and imaging technology industries, our premier reseller BSC Supply enables 3D Printlife to provide expert individualized account based service to each and every one of our customers. Our Life Support network connects end users and manufacturers with 3d printing experts in their area that provide phone, online, and even on-site technical support. Are you a 3d printing or CAD expert? Create your profile on Life Support today! Want to try one of our unique materials? Request a FREE SAMPLE or take 20% OFF YOUR FIRST ORDER! Use promo code: 3DME at checkout at take 20% off any of our Innovative Filaments!